SANTIAGO, CHILE--(Marketwire - Feb 20, 2013) - CorpBanca (NYSE: BCA) raised more than $620 million in connection with an increase in capital through the issuance of 47,000,000,000 new common shares. All of such common shares were subject to a preemptive rights offering under Chilean law, which ended on February 14, 2013. With less than 24 hours after the closing of such preemptive rights period, CorpBanca completed 100% of the abovementioned capital increase. As of February 14, 2013, CorpBanca's shareholders exercised their respective preemptive rights and subscribed and paid for 46,530,847,210 common shares (99% of the total capital increase) at an offering price of Ch$6.25 per common share; and as of February 15, 2013, the remaining 469,152,790 common shares (1% of the total capital increase) were subscribed through an auction at the Santiago Stock Exchange at an offering price of Ch$6.87 per common share. Approximately 26% of the capital increase was successfully placed in the international market, which resulted in new shareholders from the United States, England and Brazil joining CorpBanca's ownership stake. CorpBanca's chief executive officer, Fernando Massú, indicated that "the massive subscription of preemptive rights is a testament to the confidence our shareholders have in the bank's achievements during the last few years and its growth plans. This is further evidenced by high-demand by local and foreign investors' interest in becoming a part of our expansion project." The capital increase also involved the joining of strategic and long-term shareholders to CorpBanca's ownership structure. 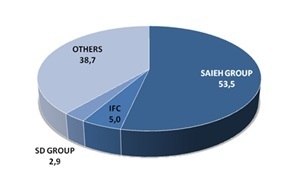 During the above mentioned preemptive rights period, International Finance Corporation (IFC) -- member of the World Bank Group -- subscribed and paid for a total of 16,998,586,200 common shares issued by CorpBanca in the amount of approximately US$225 million. Santo Domingo Group also increased its ownership in CorpBanca's equity to 2.9%. With this capital increase, CorpBanca maintains a solid equity base to finance its growth plan for 2013. CorpBanca's controlling group also demonstrated its commitment to minority shareholders, generated better liquidity in CorpBanca's common shares, diversified the shareholder base and strengthened the ADR program. As of February 19, 2013, CorpBanca's capital totaled 340,358,194,234 common shares, and its shareholder structure is displayed above.